Buy Ritchies Yeast Nutrient (Tronozymol) online from our UK Homebrew Shop. We sell Tronozymol - Yeast Nutrient 100g and other genuine Ritchies products in the UK. Tronozymol is also called yeast nutrient. Use yeast nutrient for proper fermentation of all wines. Tronozymol is also called yeast nutrient. Use yeast nutrient for proper fermentation of all wines. This yeast nutrient is sufficient for 100 litres of wine. Yeast nutrient and energiser salts. Where to buy Ritchies Yeast Nutrient (Tronozymol) safely online? 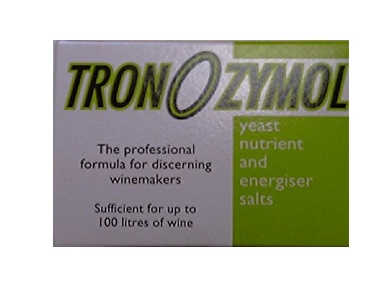 Shop at the Stirling Homebrew Shop if you are wondering where you can buy Tronozymol - Yeast Nutrient 100g safely online in the United Kingdom. Yeast Nutrient (Tronozymol) - Tronozymol - Yeast Nutrient 100g in Homebrew Chemicals and Homebrew.